Another wonderful weekend in Edmonton. We went and checked out the Old Strathcona Antique Mall, but we didn't come out with anything. Which was fine because it was just fun to wonder and get lost through the booths among booths of antique and vintage stuff. I love love love that place! For Darcy's birthday we went to Tropika Malaysian Cuisine for dinner. It was soooo yummy! I need to learn how to make satay now!! I bought some chestnuts at the grocery store today. Chestnuts are one of my favorite things about fall. I"ll always have fond memories of street vendors in Japan, Korea, and Thailand selling roasted chestnuts. I can smell that lovely aroma right now. 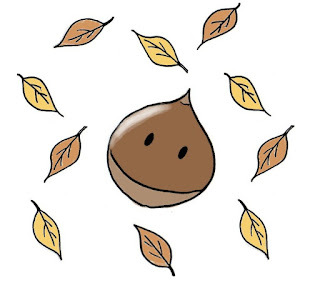 And of course it would only make sense to draw this dancing, falling chestnut.